Sanford Biggers. “Hat & Beard,” 2016. 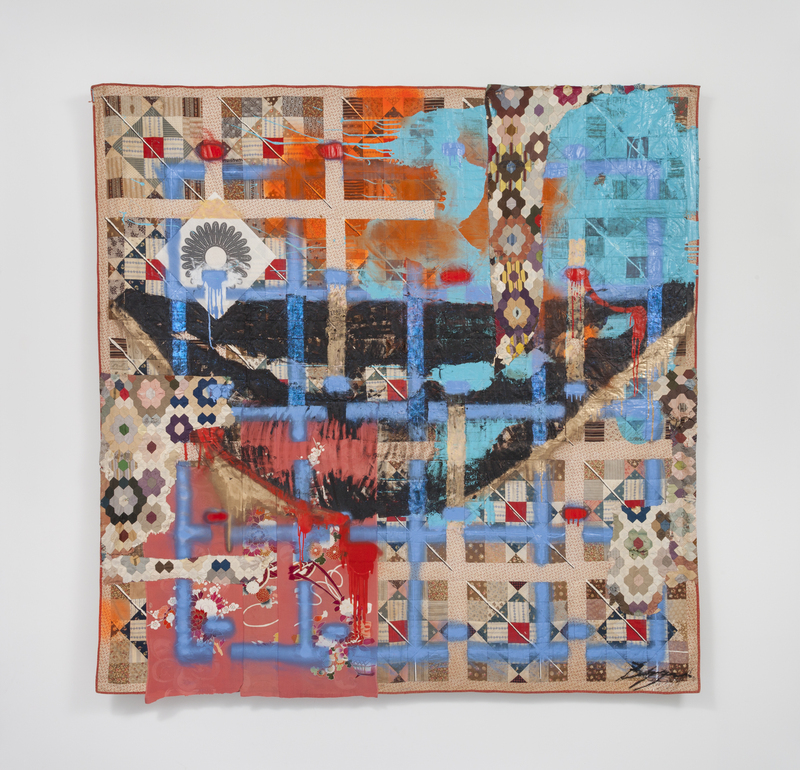 Glitter, tar, acrylic, oil stick, spray paint, assorted textiles, and screen printed fabric on antique quilts, 79 x 79 inches. 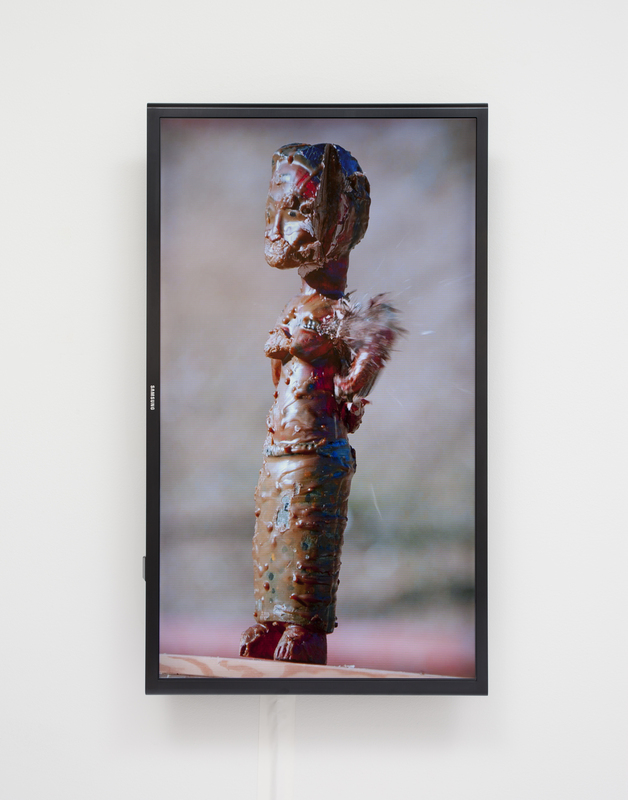 Sanford Biggers’ first solo exhibition at Monique Meloche, “the pasts they brought with them,” situates the viewer to think about tradition and culture syncretically, reflecting cultural traits that are shared but also pointing to the disjuncture of embodied experience. The “success” of othering occurs ideologically, when instead of attempting to understand another culture or perspective, one perpetuates fear and hostility. Biggers has said that the viewer constructs the meaning of art and symbolism for themself. This idea is opaque in his oeuvre, in which richly layered collages use tar, spray paint, screen-printed fabrics and quilts from the main street of Harlem, 125th Street, considered since the 1920s a hub of African-American culture. In this show, he elaborates on the smile icon in his quilted collage “Hat & Beard” by referencing his previous work “Cheshire,” a light-up sculpture of red lips and glowing bulbs as teeth. In “Hat & Beard,” the smile is more easily discerned when farther away from the piece. It signifies the Cheshire Cat in Alice in Wonderland, knowing and malicious, as well as blackface minstrels, a trope founded on racist assumptions of performing “blackness” in the 1840s. Sanford Biggers. “BAM (for Sandra),” 2016. HD video, 1 minute 13 seconds. Through April 2 at Monique Meloche Gallery, 2154 West Division.